A proper British winter has descended. Grey, damp, and bone-chillingly cold. If you do want to venture outside for a walk, as I did this Sunday, you'd better take a thermos and a snack. 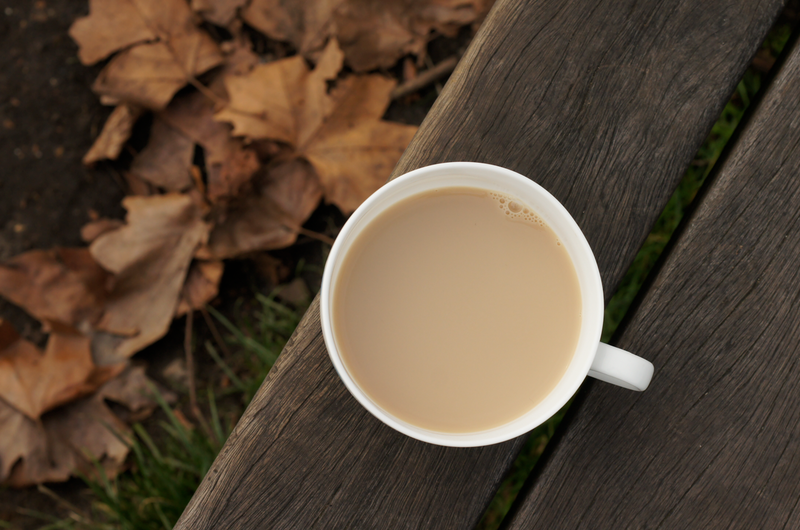 Nothing like a cup of tea to breathe some life into frosty fingers. The first time I tried to photograph these cookies, they refused to play game. I was just on the edge of giving up and scrapping the post when I realised I should push myself forward instead. 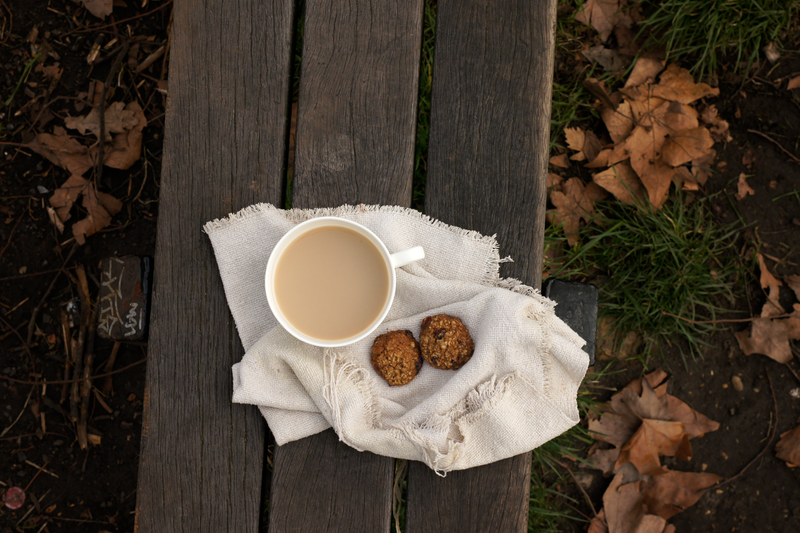 So I baked up a new batch from the freezer, wrapped a few in a piece of cloth, make some tea and ventured out to the park for a picnic. Living in a big city, I miss the silence. I grew up in the countryside, taking long walks most days through the fields and wild woods, by the rivers and over the bleak moors. The mountains we visited and lived in are quiet, majestic and full of crisp, clean air. 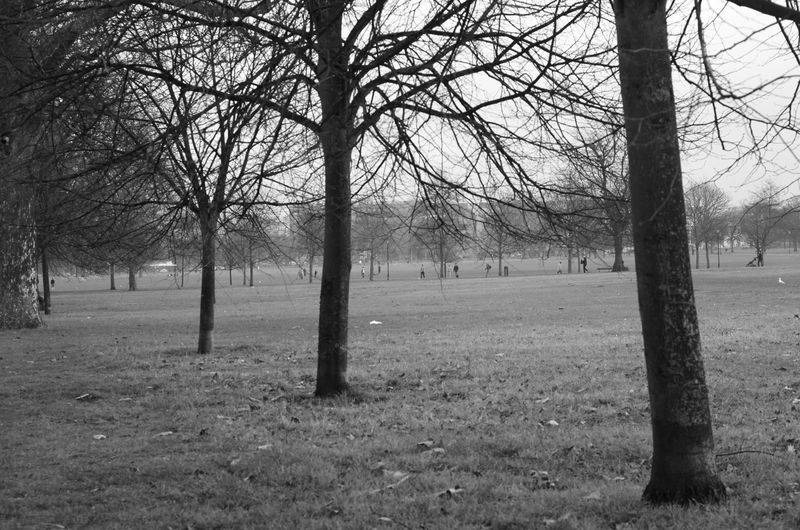 Even though there are green spaces here, they are hemmed by noisy roads and filled with families, cyclists, dog walkers, skate parks, shouting footballers, joggers. Sometimes I want to escape to a space that doesn't bear the touch of humanity. 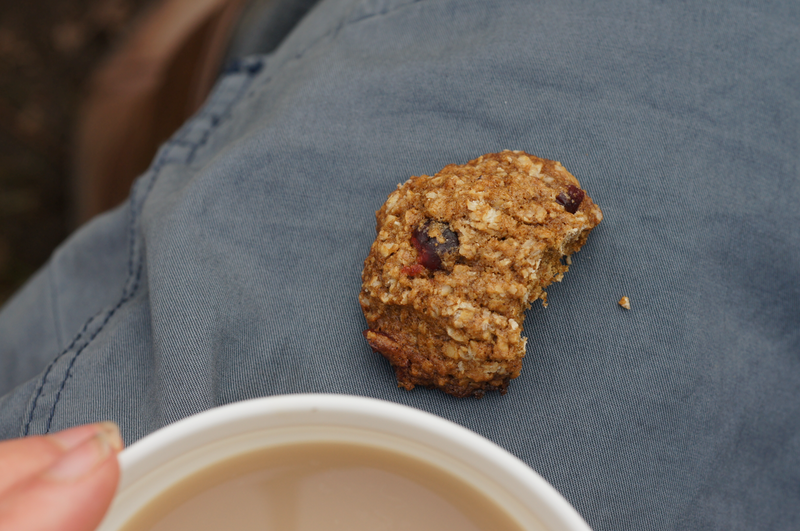 Besides the silence, it would also be nice as then nobody would be there to look at me like I've gone totally batty because I'm standing on a park bench (/mossy boulder) taking pictures of a cup of tea and some cookies. I'm on a dried cranberry kick at the moment so I adapted the recipe to include them. The cookies taste of nutty oats rounded off with brown butter, brown sugar, a touch of spice and salt - all offset by the fruity, slightly sharp cranberries. Rustic and satisfying. The dough freezes beautifully - you can just take however many out want out of the freezer and bake them. Delicious, warm cookies in 15 minutes flat. Melt the butter in a wide pan. Keep heating as it foams up. When the foam starts to reside, rusty brown flecks appear and it starts smelling fantastic, scrape all the butter and flecks into a bowl to cool. In another bowl, whisk the sugar, egg and vanilla together until smooth. Sift the flour, bicarbonate of soda, salt and cinnamon together. Once the brown butter is down to body temperature, whisk into the egg mix. Gently stir in the flour mixture until everything is combined. Finally fold in the oats and cranberries. Cover the bowl and put into the fridge to chill. Leave to chill for 1 to 24 hours. Preheat the oven to 180C/350F. Scoop out tablespoonfuls of dough onto a sheet - if baking immediately, leave a few inches gap. If freezing, place closely together then freeze on the sheet before putting in a bag the next day. Place into the oven and bake for 10-12 minutes from the fridge, 11-13 from the freezer - they should be golden and crisp on the outside. Cool on a rack. Edited 07/10/15 - I've recently tried this with dried cherries, which worked well. Cranberry and oat are my favourite cookies ever. I also add coconut. they are called craisins here in Australia. 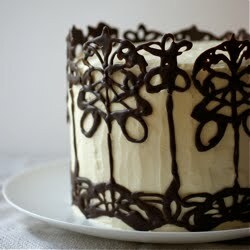 I love the weather in your photos and the cookies look oh so good! 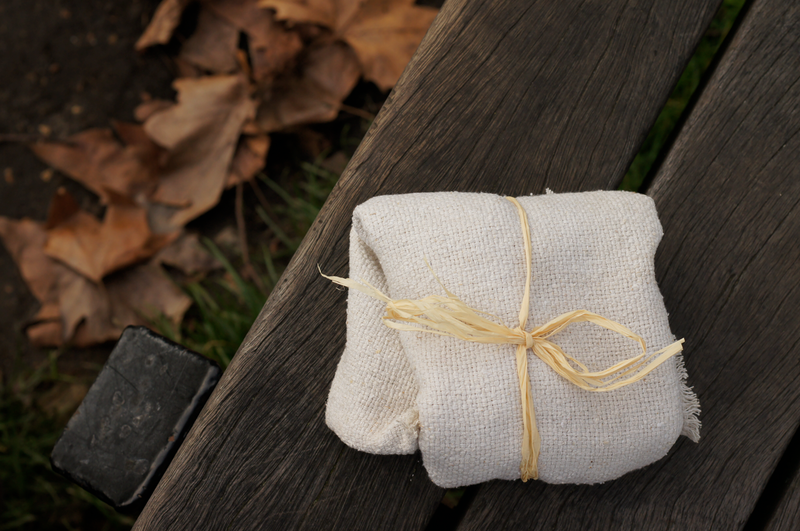 I love the idea of taking your cookies out to the park, it really captures the light so beautifully. I love dried cranberries in everything at the moment. These cookies look delicious and the light in your pictures is amazing..love it! On your side about the wilderness, too. I grew up in the boonies and it's still kind of odd for me to be in the city for school. I like it, but I don't think I'll ever get used to neighbors being so damn close! I love the cookies and I love the pictures! I feel you on the noisy city bit. In Singapore, getting away like you want is impossible unless I go into the woods. Shooting the cookie outside was a perfect idea, luckily no passer by asked you for a cookie. This is close to the dried blueberry ones I made last Christmas. Absolutely lovely. Do you freeze this cookie after it has been baked or while still unbaked? If unbaked, do you preform the cookies and freeze them on a baking sheet first? Sneh | Cook Republic: Coconut sounds like a wonderful addition! Do you add the dessicated stuff to the mix? I hadn't realised that's what craisins are. london bakes: Thanks - the light was beautifully even and overcast. They're so delicious, aren't they. I particularly like them in flapjacks. Angela @ the fairy bread chronicles: White chocolate would be delicious. I don't think I've ever tried a Bill Granger recipe, though I've come across a few - I'll have to give one a go! El Pasticcio: I'm glad you like them! That overcast light works really well for food. Kaitlin: It's such an annoying feeling isn't it, especially when you're happy with the recipe. They're not the most photogenic of things I guess. The neighbours thing is weird - not only that they're there, but that they're so anonymous! I hardly know any of them - even by sight. Aurelie: Aw, what a lovely comment! I'm so glad you find it relaxing and peaceful. Big cities are funny- I love to visit them (I'd love to see Madrid!) but I'm not sure I'm cut out for living in one. I like towns and small cities more - Oxford was the perfect size. Pick Yin: It's difficult, isn't it. I probably could get quiet if I went out at funny times of day/night - but then I wouldn't feel safe! Funny really. Londoners don't seem to be the types to strike up random conversations/ask for cookies really. Dried blueberries sound like a great idea, I've never tried them. Tracy: As I think I mentioned in the recipe, I froze them after they'd been formed on a sheet, then once they were frozen I transfered them to a bag. When I want them I just bake them from frozen for a few extra minutes. Hope that helps. No cookies should be SO GOOD! Hi Emma, this is a very nice recipe. I love the combination of cranberries and oats. 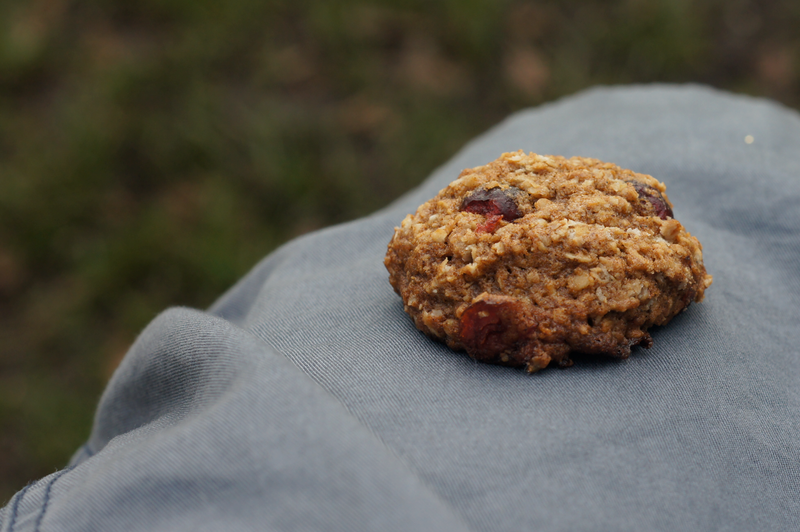 I've tried other cranberry/oat cookie recipes and I have to say I really like yours as they're not too sweet. But, I did find them quite buttery. Is there something I could substitute in place of the butter to get a less greasy biscuit? Also I think they would taste really nice with some nuts added, maybe pecans or walnuts. Agnes - I'm so glad you liked them (and that you made it official)! Made these yesterday - so almost a year after your original posting! To check - what you do with the butter in the first step - that is making brown butter, right? Anyway, they were delicious. I subbed in the nutmeg for cinnamon (1/2 tsp) to make them taste a bit more like the cranberry/cinnamon biscuit I regularly spend 2 euro on - and they were a good match! Thanks for a great recipe. Yes, it is brown butter - probably should have mentioned it! So glad they were a good match for your biscuit. Love the idea of a bit more nutmeg too.